My sites biggest source of traffic is from Google, it makes up about 50% of my total traffic, so a slump in traffic from Google or a hit to my SEO ranking would really not be great for my business. But, for the reasons I explain in this post, I decided a change in business name (and therefore domain name) was necessary. Just before I changed my domain name I had been Googling, hoping to find a post exactly like this one that would share someone else's experience pre and post-domain name change. So to be honest, I'm writing this for my past self, and any of you who are in the same boat right now. I was lucky before changing my domain in that I was hanging out at a coworking space in Bali and therefore had SEO experts all around. But granted, they couldn't provide any sort of guarantee as to what would happen either, though I found their info interesting, so I thought I'd share it here with you too. An SEO expert who assisted many past clients with domain name changes let me know the results he'd seen on clients sites. Some sites lost all Google traffic after the change and very slowly saw it climb back up over months with the new domain, some saw no change at all to their Google traffic, and others saw a short slump in their traffic before it picked back up to pre-change levels in just a couple weeks. Basically, there's no way to know what will happen, it's a gamble. But anyway, here's what happened to me. 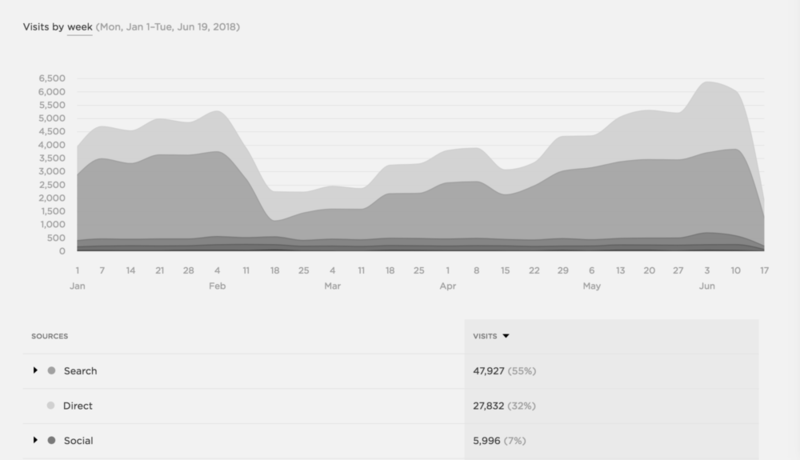 The darkest grays below that is social, referral and email traffic. I knew it was still the right long-term choice for my business and I was ready to wait it out. Thankfully, the very next week I saw an ever so slight increase in search traffic, and it continued to pick up week by week, slowly but surely. It's been 4 months and my search traffic just reached pre-domain name change levels. Again, it's hard to know if what happened to me will be the same as what will happen to you, but I hope that gives you a little peek at one person's experience. I have a whole lot of no idea if this made an impact on my search traffic and how quickly/slowly I gained it back, but it's worth mentioning to you anyways I feel. 1. I notified Google of the change via their 'change of address' tool, a part of Google Search Console. If that sounded like gibberish, basically that means that Google has a tool where you tell it your old and new domain names, so Google learns that the old site is the same as the new one. Google Search Console is one of Google's many tools. Search Console specifically helps you look behind the curtain at what's up with your site's SEO. If you'll be changing your domain, I'd def suggest letting Google know by using the change of address tool. You can find an article on doing that here. I didn't want all past links to blogs and my site to break, and I didn't want to set up redirects for every link, so I just kept the old domain name connected to my Squarespace site, just as a secondary domain. My new domain, paigebrunton.com, is my primary domain. That means if someone follows a link to the old thepaigestudio.com, it will still take them to the correct page, but the address in the address bar will automatically change to paigebrunton.com. If you also use Squarespace for your website, this article explains how to set up secondary and primary domains. I was pleasantly surprised with how absolutely painless and easy it was to do - thanks Squarespace! So there we have it, that was my experience with changing a domain name. While the loss in traffic for a few months wasn't wonderful, I'm happy with the new domain and feel it was definitely worth it overall for my business.